Do you have a brand or business that are in need to strengthen its identity or do you want to add credibility to your product portfolio? With the help of our beloved characters we can help you reach your goals. Our most famous characters like Little Anna, Laban, The Thumb and The Tall Uncle have helped different products and businesses to reach their goals. The results are often seen in increased identification and joy from the consumer and in increased sales. An example of this are the books that are based on our brands, these can be found on glorious second place in the Swedish library’s list of most lent books. A confirmation that we have one of the Nordic countries most popular children’s book characters. To become a licensee of our brands you have to fulfill our highly set standards. We are strict in which situations the license will be used and our demands for quality is set very high. It’s important that the companies that have the possibility to use our brands represent the core values in a correct way, for example by expressing good self-esteem and safety but also by communicating the joy and happiness our brand represents. The strongest target group by age is 0 to 5 years. Today we have around 1200 products based on the Laban character in the Nordic market and parts of asia, which is shared with the rest of the characters like Little Anna, The Tall Uncle and The Thumb. We also believe that is has to be inspiring and pleasant with the partners we choose to collaborate with. Filmlance International AB - Filmlance is one of Sweden's largest independent production company, which since its inception in 1988 produced quality films for both cinema and television. Filmografin includes 70 titles. Films, television drama, animation and short films. Several of the productions have won awards and get great attention at festivals worldwide. Raben och Sjögrén (Norstedts) - Norstedts, one of Sweden's leading children's and young adult book publishers. The publishing house publishes books for all ages by leading Swedish and international authors and illustrators, as well as audio books, music, games and non-books. Rights & Brands - Are a literary rights and brand licensing agency. Our services include all aspects of character representation and branding, from publishing and PR to licensing, merchandising and digital. Starting from a strategic base in Nordic literature and design, our platform is built on knowledge, passion and people. With a worldwide network of sub-agents and over 600 clients, our international knowledge and business capacity is unique. We want everyone to feel safe through friendship, knowledge and environmental conditions. In friendship one should be able to feel safe and be able to evolve along with his friends in a great environment. 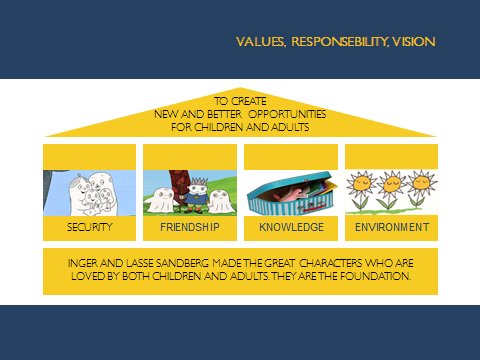 Inger and Lasse Sandberg’s books and characters are easy for children to understand and easy for older children to read themselves. They are also often familiar to the children. We are constantly working to create new and better opportunities for children and adults. Through knowledge create security, learn to be a good friend and to protect our environment. A healthy and safe environment for us has always been incredibly important. Both in term of the development of safe and non-toxic products and to always use an environmentally friendly option as possible when it comes to handling and shipping. We focus on the people around us, the children who are our future and by providing them with knowledge, self-esteem and security, they will be able to manage and improve it in the future.